smacked silly by the mother of all rainy seasons here in Southern California. So far it's looked like most years at this time. Now and then we get a sprinkle or two, a few actual rains here and there. Today we got a nice little downpour during the mid-afternoon. It was good to see the ground get wet. 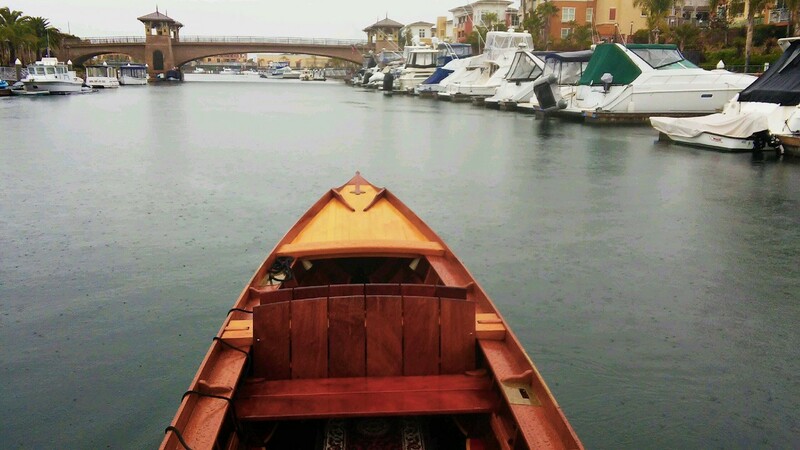 Turns out that Mark up at Gondola Paradiso in Oxnard got a little washdown from it while he was out rowing his batela "Maria". "missed the Pacific Northwest and all the clouds and rain"
Maria was built at the Northwest School of Wooden Boat Building in Port Hadlock, Washington. sealing treatments before she was sent off to her home in California.